Bugging device found in Ghana ministers office. The former Ghana Lands and Natural Resources Minister, Alhaji Inusah Fuseini has admitted planting the audio-visual recording device which was recently discovered in Mr John Peter Amewu’s office. It was revealed on Monday that the office of the current Minister of Lands and Natural Resources, Mr John Peter Amewu, had been bugged. A secret camera and recorder was found during a recent screening [sweeping] by National Security. 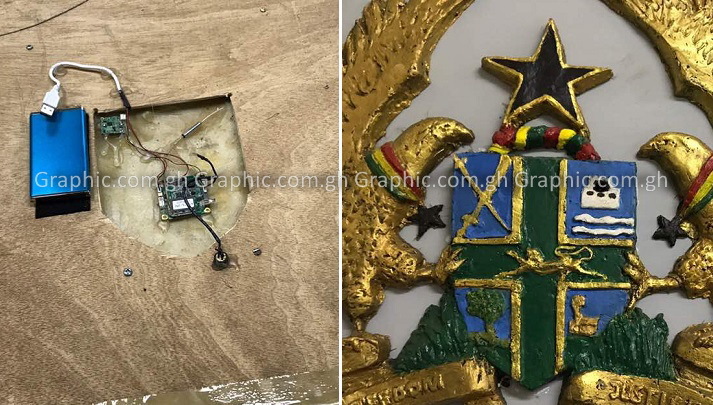 The device is said to have been planted behind Ghana’s Coat of Arms which hung in the office. In separate radio interviews on Peace FM and Neat FM Tuesday morning, Alhaji Fuseini explained the device was planted for his personal security in that office whilst he was the sector minister in 2013.He however said he did not inform his successor about it because it was not working. Asked why he did not take it away when he was moving out as sector minister since it was a personal property he said, “for what purpose,” adding that he left it there because it was not working. Nii Osah Mills took over from Alhaji Fuseini as Lands and Natural Resources Minister before John Peter Amewu in January this year. The device (pictured above), a recorder which is said to be able to pick low volume sounds about 30 metres away with a data storage unit and a transmitting unit, was pinned to the back of the Coat of Arms that hanged in the minister’s office, and Alhaji Fuseini said it was planted there around 2013 whilst he was fighting illegal mining. His explanation was that he wanted to monitor people who were moving in and out of his office either in his presence or absence.National Security operatives recently retrieved the gadget after a routine screening exercise at the Ministry. The BNI is still conducting investigations into the matter and Alhaji Fuseini says he was yet to be contacted about the device.According to Alhaji Fuseini, the gadget was given to him as a gift when he was the Minister to aid him monitor what went on in his office. He noted that the device was, however, not fully installed, and, so, the anxiety about spying on the current Minister who is at the forefront of fighting illegal small-scale mining was unnecessary. “That was my personal property… It was not working. The installation was not completed,” he said.